James Wait is a dying West Indian black sailor on board the merchant ship Narcissus sailing from Bombay to London. Wait becomes seriously ill during the voyage, and his plight arouses the humanitarian sympathies of many of the crew. However, the ship’s captain and an old sailor named Singleton remain concerned primarily with their duties to the ship and appear indifferent to Wait’s condition. Heart of Darkness was first published in 1899 and is a novella about a voyage up the Congo River into the Congo Free State, in the heart of Africa, by the story’s narrator Marlow. Marlow tells his story to friends aboard a boat anchored on the River Thames, London, England. This setting provides the frame for Marlow’s story of his obsession with the ivory trader Kurtz, which enables Conrad to create a parallel between London and Africa as places of darkness. Central to Conrad’s work is the idea that there is little difference between so-called civilised people and those described as savages, and the story raises important questions about imperialism and racism. The novel is set in London during 1886, where Mr. Adolf Verloc works as a spy for an unnamed country (presumably Russia). The Secret Agent is notable for being one of Conrad’s later political novels in which he moved away from his former tales of seafaring. Thematically, it features anarchism, espionage, terrorism, and also the exploitation of the vulnerable, particularly in Verloc’s relationship with his brother-in-law, Stevie, who is mentally retarded. Because of its terrorism theme, it was noted as one of the three works of literature most cited in the American media two weeks after the September 11 attacks. The recently appointed captain of a ship anchored in the Gulf of Siam (now Thailand), feels like a stranger to his new command, the ship and his crew. As a goodwill gesture towards the crew, he announces he will take the anchor watch until one a.m., something usually not done by a ship’s captain. During the watch, while the hands are asleep, he discovers a naked man in the water. He fetches him some of his own clothes and takes him into his stateroom. He feels an inexplicable affinity to the man and keeps his presence secret from the crew. Also contains the novella, Heart of Darkness. Typhoon describes how Captain MacWhirr sails the Siamese steamer Nan-Shan into a typhoon. Other characters include the young Jukes (probably an alter ego of Conrad from the time he sailed under captain John McWhirr) and Solomon Rout, the chief engineer. This classic novella evokes the seafaring life at the turn of the century. MacWhirr (who, according to Conrad, "never walked on this Earth") is emotionally estranged from his family and crew. He refuses to consider an alternate course to skirt the typhoon, but his indomitable will in the face of a superior natural force elicits grudging admiration. The three other stories included are: Amy Foster; Falk, a Reminiscence; and To-morrow. 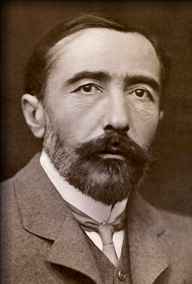 Joseph Conrad (1857 – 1924) was a Polish-British writer regarded as one of the greatest novelists to write in the English language. He was granted British nationality in 1886 but always considered himself a Pole. Though he did not speak English fluently until he was in his twenties (and always with a marked accent), he was a master prose stylist who brought a distinctly non-English sensibility into English literature. He wrote stories and novels, many with a nautical setting, which depict trials of the human spirit in the midst of an impassive, inscrutable universe. Conrad’s narrative style and anti-heroic characters have influenced many authors, including D. H. Lawrence, T. S. Eliot, F. Scott Fitzgerald, William Faulkner, Ernest Hemingway, George Orwell, Graham Greene, William Golding, William S. Burroughs, Gabriel García Márquez, John le Carré. And many films have been adapted from, or inspired by, Conrad’s works. Writing in the heyday of the British Empire, Conrad drew on his native Poland’s national experiences and on his personal experiences in the French and British merchant navies to create short stories and novels that reflect aspects of a European-dominated world, while profoundly exploring human psychology. Jim, a young British seaman, becomes first mate on the Patna, a ship full of pilgrims travelling to Mecca for the hajj. When the ship starts rapidly taking on water and disaster seems imminent, Jim joins his captain and other crew members in abandoning the ship and its passengers. The captain evades the judicial court of inquiry, leaving Jim to face the court alone. He is publicly censured for this action and the novel follows his later attempts at coming to terms with his past. Kaspar Almayer is a Dutch trader in the Borneo jungle in the late 19th century. He is married to a native Malayan who loathes him, and they have one daughter, Nina, whom Almayer adores. Previously, he heard the British were to conquer the Pantai River, and he built a large, lavish house to welcome them. However, the conquest never took place and the house remained unfinished and became known as “Almayer’s Folly”. Almayer now continually goes out on long trips, searching for a hidden gold mine in the hope of becoming wealthy, so he can provide for his daughter.